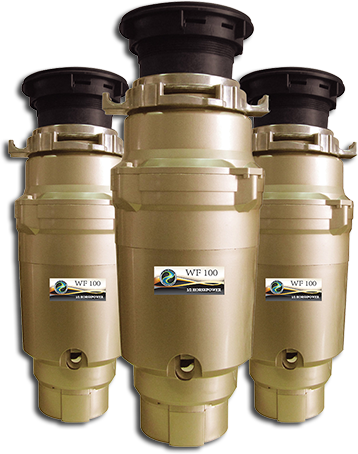 Waste Force units provide the best value waste disposers available on the market today – just compare the features, specs and guarantee. They come with a 10 year warranty and are made to our high specifications by a major disposer manufacturer who has been making them for over 20 years. In the UK they are distributed exclusively by The Henley Fan Company who have been in business since 1999. They can be fitted by any plumber and to keep the costs down are only available to buy online above. No 1 reason – Waste Force stands behind the quality and reliability of it’s products with a 10 year warranty. 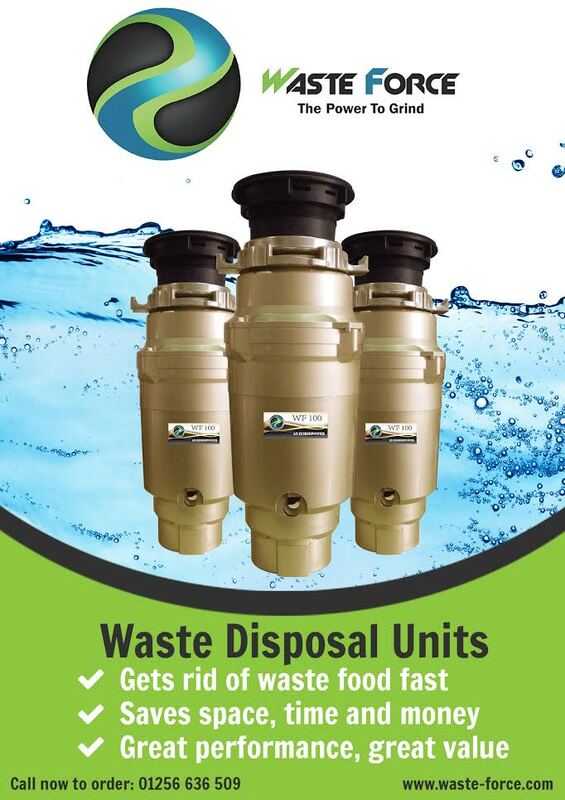 No other disposer on the market even comes close to that at this with warranties of 2-5 years being typical. The few that do offer 10 year warranties are priced much higher sometimes more than double ours. No 2 reason – Each Waste Force disposer model has a higher specification than it’s closest competitors offering unbeatable value for money – see the graph to the right which shows how Waste Force beats the market leader, Insinkerator, hands down on each of the 4 most important selection factors. Cheaper units don’t have to be junk although many are. Food waste disposal is an aggressive activity and calls for a really robust standard of design and manufacture. Our units are made in an ISO 9000 certified factory in China with a long standing reputation for quality. Waste Force doesn’t compromise on any of the components and specifications focusing on what is needed to give outstanding and reliable performance. 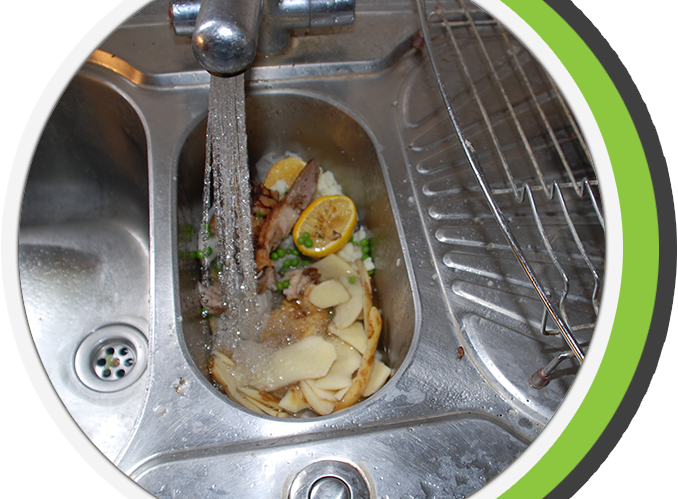 The food waste leaving the disposer in your kitchen is flushed into the main waste drain from your house where it passes to your local sewage treatment works. Here the waste is broken down by the sewage treatment process leaving an organic sludge. This sewage sludge is either spread directly onto land as a fertiliser since it is rich in nutrients or in 88% of the sewage works in the UK it is anaerobically digested. This natural process breaks the sludge down into methane or biogas which is then used to generate electricity which is fed back to the grid. 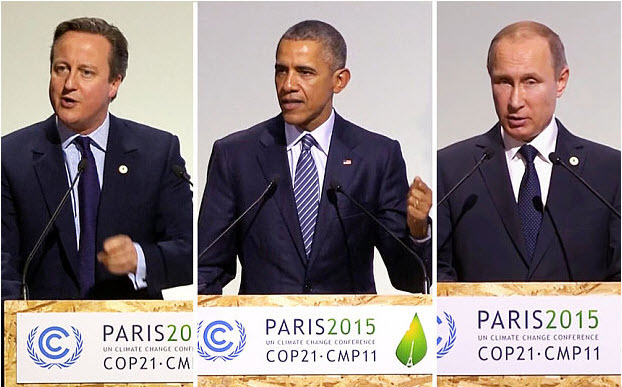 This generates a carbon credit since it is reducing carbon dioxide emissions. Without a waste disposer your food waste will be put into a plastic bag where it will attract disease carrying vermin and insects. It is then left out on the road for the local refuge service to collect, carried by truck (more waste emissions) to the nearest waste transfer station before going again by truck to be deposited in a landfill. Here it gradually rots down and is converted into methane which is a very powerful greenhouse gas, 25 times more damaging to the environment than CO2 and a major contributor to climate change. So using a waste disposal unit brings about a double benefit for the environment. And since about 25% of household waste is food waste that is a potentially massive benefit. This is why the leading environmental countries around the World like California, Sweden and New Zealand mandate that all new homes have to have a waste disposal unit in them. See waste-disposal-unit.com for further info. Waste Force – On Special Offer Now! WF-100 Waste Force Unit - RRP £256 offer £179! 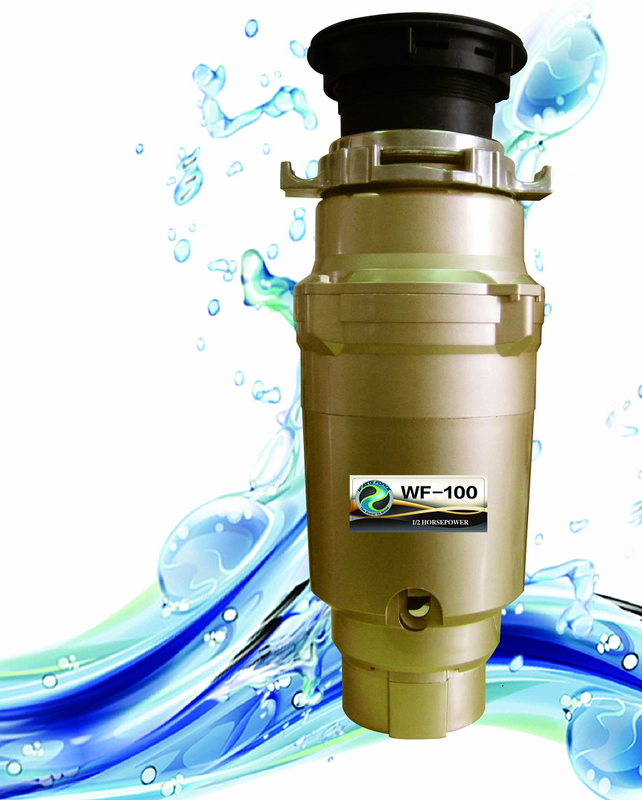 WF-200 Waste Force Unit - RRP £285 offer £199! Fixed Price Installation Service - RRP £200 offer £149! We provide an installation service in London and the home counties, only for Waste Force units purchased directly from us. To install within the central London charging zone is £50 more. Installation includes a top quality leak-proof McAlpine universal waste connector, air-switch button and plastic pipework to make good. 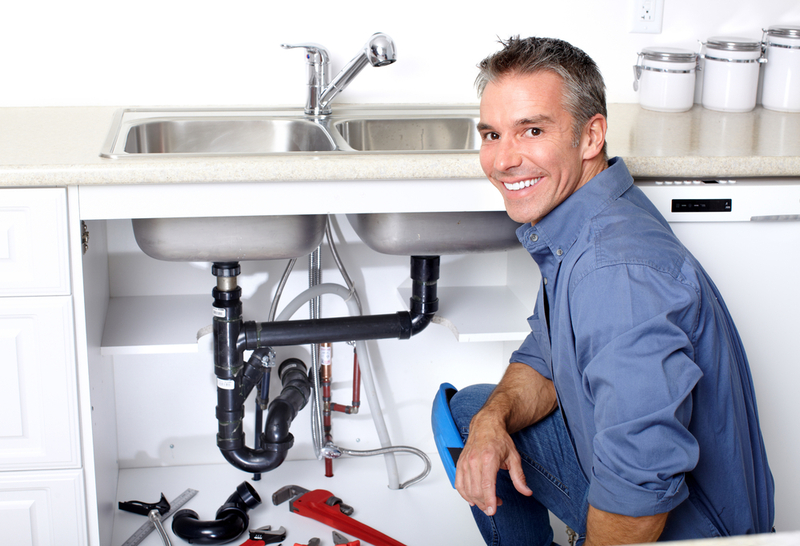 It will be fitted under your sink and connected to the existing waste pipe assuming that this is in good condition – if not then we will replace the pipework at cost. A fused spur electrical socket under or near the sink is required which if not present can be fitted by your local electrician for around £50 or we can do this too. NB: Please check the dimensions on the product data sheet before ordering to ensure you have sufficient space under your sink to fit the model you want especially if you require the larger WF-200 model. Please contact us to arrange an appointment. Why settle for less? - Get Waste Force working for you now! Using a Waste Force disposer can stop health hazards like this occurring. Rotting food attracts all manner of vermin, insects and disease posing a risk to you and your family. Instead the waste food is sent to the sewage works where it is recycled into electricity. 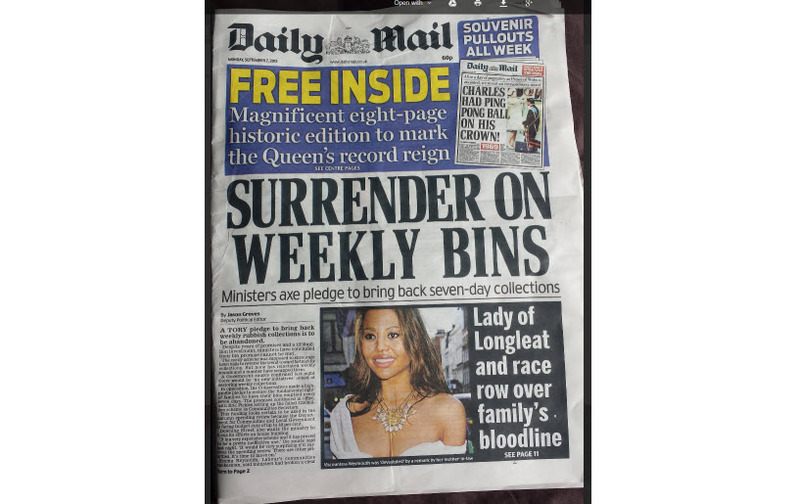 Get Yourself A Daily Bin Collection! Here we address some of the questions we most often get asked by customers. 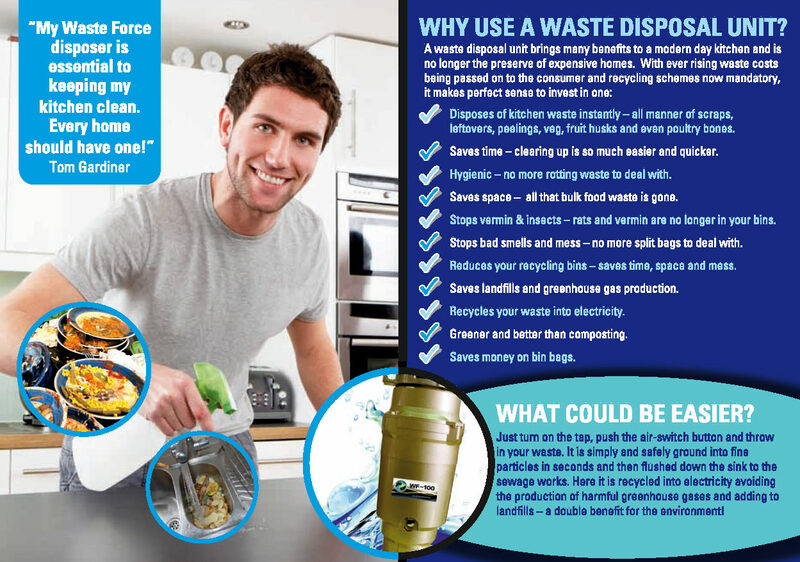 Why use a waste disposal unit? A waste disposal unit brings many benefits to a modern day kitchen and is no longer the preserve of expensive homes. With ever rising waste costs being passed on to the consumer and recycling schemes now mandatory, it makes perfect sense to invest in one. 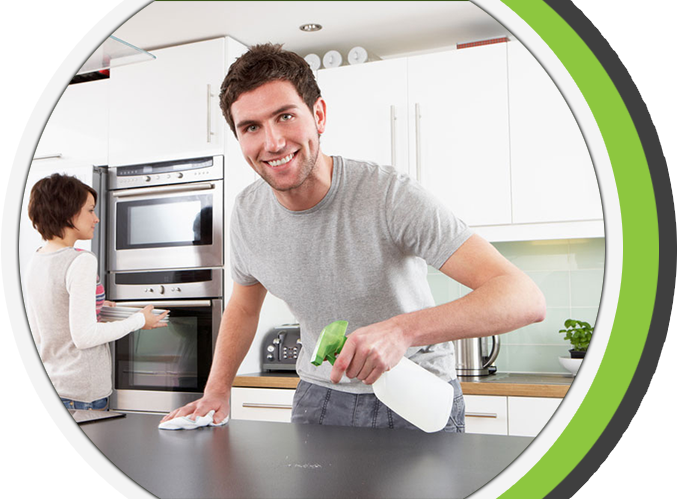 It is the quickest and easiest way to dispose of your waste food and to keep your kitchen clean, fresh and hygenic. Rotting food attracts all sorts of disease carrying vermin, insects and disease which is not what you want in your kitchen or on your doorstep. 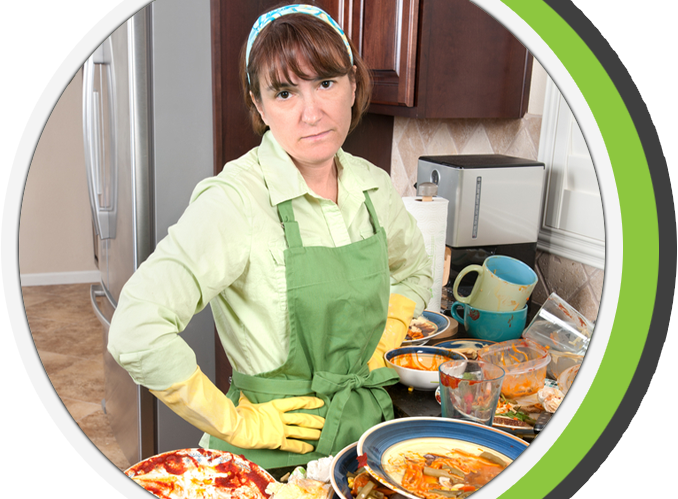 Simple rinse off any dirty dishes and mess down the sink and the disposer takes care of the rest. The waste is ground up into tiny bits by an impeller and grinding ring before being flushed away into the waste pipe to the sewer where it gets converted into biogas and in turn electricity. What waste food can be put down a disposer? Pretty much any food can be put down a decent waste disposal unit. Meat, poultry, solid fat, vegetables, fruit incl pineapple tops, fruit seeds, liquid hot fat (if mixed with some washing up liquid and cold water first), bread, pasta, even poultry bones (not other bones), husks, egg shells. The only thing not recommended are stringy items like the centres of sweet corn hobs. What happens to the waste food? The waste is pulverised into fine particles by the unit and then flushed down the drain where it passes with all the other household waste to the sewerage works where it is turned into useful electricity saving on greenhouse gases – methane and carbon dioxide. What are the benefits of using a waste disposer? You just turn on the tap, push the air-switch button and throw in your waste. It is simply and safely ground into very fine particles in seconds and then flushed down the sink where it joins the rest of the household liquid waste and is taken to the sewage works. Here it is recycled into first biogas and then electricity avoiding the production of harmful greenhouse gases and adding to landfills – a double benefit for the environment. 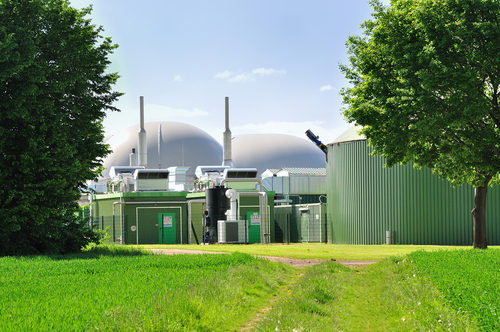 Already 88% of the UK’s sewage works have anaerobic digesters which convert the organic matter in the waste into biogas and soon it will be almost 100%. The leading countries in taking care of the environment make big use of waste disposal units and some even mandate it. All new build homes in California have to have one. About 95% of homes in California have one. The figure for the USA overall is 55% as it is in Sweden. The UK by contrast is just 6% and is sadly lacking. 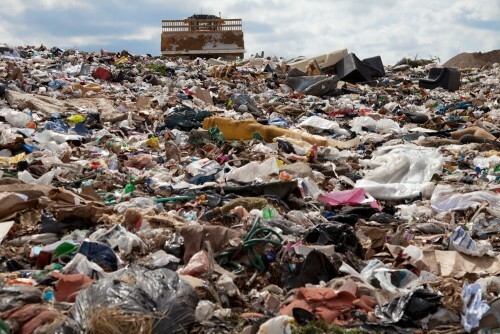 Councils have been pushing recycling using composting but this is no where near as good since the organic matter smells especially if fat is present, it requires space, leaves lots of material and releases methane and carbon dioxide into the atmosphere directly. 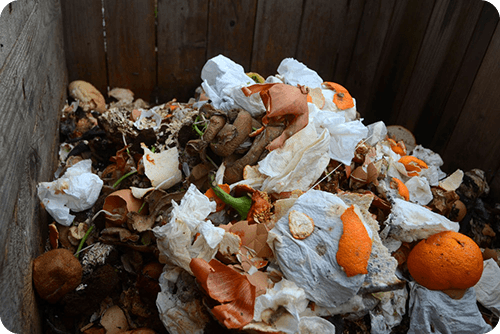 Waste disposal units have none of these drawbacks and make then an ideal solution for all homes especially apartments where composting is not an option due to lack of space. With WDU’s councils can easily make biweekly bin collections since most of the problems associated with that disappear. Why is Waste Force better than other brands? We offer a 10 year warranty on all our units. No other unit on the market offers such a long warranty at this price. Waste Force units are manufactured to a higher specification than competitors units. Look at the features and benefits above and you can see how much experience and thought has gone into the design. The units are made in an ISO 9000 certified factory which also has many other certifications to ensure quality manufacture. They have been making food disposer’s for over 20 years and supply to a number of other large brands in other countries. As a result we offer the best possible value product with better performance and warranties than our competitors. Don’t take our word for it – check out our features and performance with other brands. A Waste Force WDU can be installed in less than an hour by a competent DIY person or plumber. 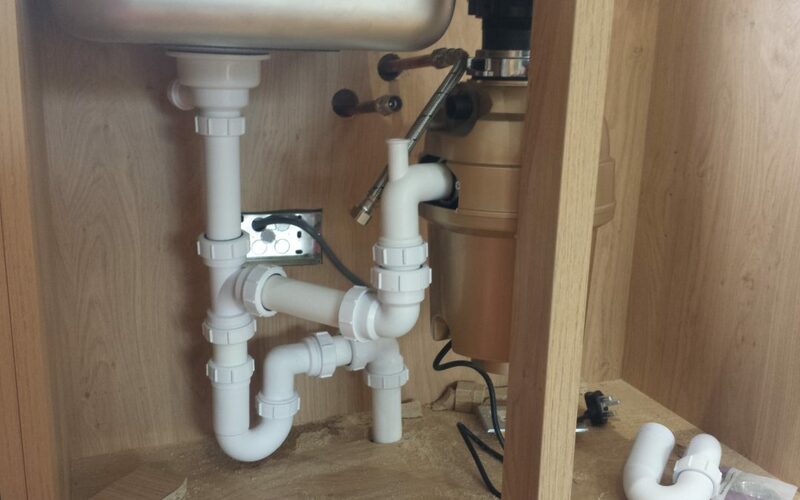 The unit is hung off the sink using the replacement sink flange that comes with the unit. The quick fit MountMaster connector makes fitting quicker and there is no need for putty on a steel sink. A replacement adjustable waste connector is needed to join with the existing waste pipe. The safety air-switch is mounted in the sink where there is usually a knock-out blank. The unit comes with a UK BEAB plug and so requires a spured fused electrical socket under or near the sink. If this is not present then an electrician need to install one. Our installers supply all the parts needed and will test the unit and demonstrate its use to the customer. All Waste Force units are warrantied for 10 years but should and do last longer than that depending on their use and abuse. They are warrantied for life against corrosion (LCW) of the chamber which is one of the major causes of failure of waste disposal units. I am very pleased with my WF-200 unit. It was fitted by the company in just half an hour and works a treat. I get rid of so much waste that my bin bags have more than halved. I don’t know how I managed before. I am really delighted with my WF-100 waste disposer. It is the first time I have had one having seen them in America while on holiday there and think they are great – worth every penny! I replaced my Insinkerator unit with the WF-300 as I got fed up with it jamming regularly and the time wasted getting it running it again. Waste Force is great and so far not a single jam – I would recommend it to anyone. Why wait - Start to enjoy the benefits of Waste Force power now! No kitchen should be without one. Order online now or from one of our approved stockists throughout the UK. By subscribing to our mailing list you will always be updated with our latest discounts and updates from us.